PDF File Download "The community banks: The evolution of the financial sector, Part III"
Community banks play a key role in their local communities by offering traditional banking services to households and lending to nearby small businesses in the commercial, agriculture, and real estate sectors. Because of their close relationship with small businesses, they drive an important segment of economic growth. In fact, compared to all other banks (and to credit unions), small banks devote the greatest share of their assets to small business loans. In this paper, titled “The community banks: The evolution of the financial sector, Part III,” (PDF) Baily and Montalbano examine the evolution of community banks before, through, and after the financial crisis to assess their recovery. The authors find that despite concerns about the long-term survival of community banks due a decline in the number of banks and increased Dodd-Frank regulations, they continue to recover from the financial crisis and are in fact out-performing the Big Four banks in several key measures. Although the number of community banks has been steadily declining since before 2003, most of the decline has come from the steep drop in the smallest banking organizations—those with total consolidated assets of less than $100 million. 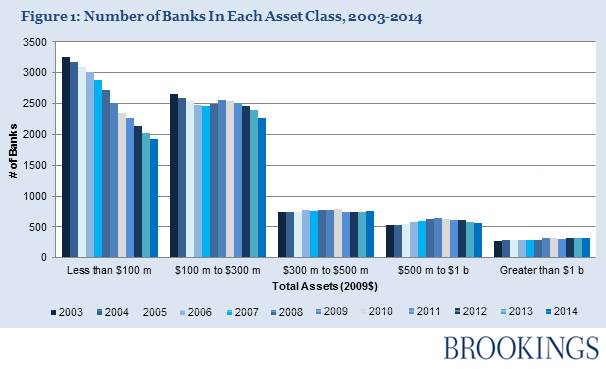 Community banks with total consolidated assets that exceed $300 million have in fact increased in number. Most of the decline in community banks can be attributed to the lack of entry into commercial banking. In a previous paper, Baily and Montalbano showed that the gap in loans and leases among the Big Four has widened since the financial crisis, but the new research finds that community banks seem to be returning to their pre-crisis pattern, although slowly, with the gap between deposits and loans shrinking since 2011. While total deposits grew gradually after 2011, though at a pace slower than their pre-crisis rate, loans and leases bottomed out in 2011 at $1.219 trillion. The authors also examine community banks’ return on assets (ROA), finding it was lower overall than for the Big Four or for the regionals, and has come back to a level closer to the pre-crisis level than was the case for the larger banks. The level of profitability was slightly lower for community banks in 2003 than it was for the larger banks—about 1.1 percent compared to 1.7 percent for the regional banks—but it did not dip as low, reaching a bottom of about -0.1 percent compared to -0.8 percent for the regional banks. Baily and Montalbano also find that total assets of the community banks increased 22.5 percent (adjusted for inflation, the increase was 7 percent); the average size of community banks has increased substantially; total bank liabilities grew steadily from 2003-2014; the composition of liabilities in post-crisis years looked largely similar to the composition in the pre-crisis years; and securitization—which plays a relatively small role in the community banking model—has been steadily increasing in the time period both before and after the crisis. To read more, download the full paper here. The paper is the third in a series that examines how the financial sector has evolved over the periods both before and after the financial crisis of 2007-2008. The first paper examines the Big Four banks, and the second takes a closer look at regional banks.